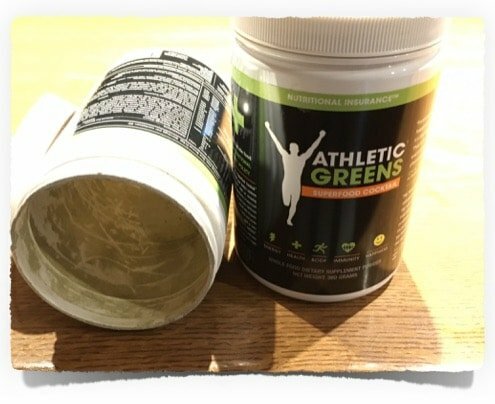 Athletic Greens Test: Is it really the best greens powder? … you should take vitamins and other nutrients in their natural form, i.e., by eating fruits and vegetables. An important study was conducted in 2004 by biochemist Dr. Donald Davis at the University of Texas. Davis discovered that plants today have in part a much lower nutrient content than they had 50 years ago. Reasons for this include that agricultural companies today consider other “qualities” to be more important, especially increases in revenues and greater harvests. It was not easy to conduct this study because the comparative values from 50 years ago were not available for many plants. Nonetheless, he was able to compare the nutrient value of 43 different plants between then and now. Admittedly: you can always find pros and cons on any subject you research on the Internet. Personally, am very weary of how things are handled in the food industry today. I admit: it is certainly easy to get upset without doing anything about it yourself – or, in the worst case scenario, contribute to making the situation even worse. Nonetheless: it irks me that unprocessed fruit and vegetables always have to carry the label “organic” today. As though as that were something special. Organic is the natural, original state! Why can’t we just continue to call our unprocessed plants by their name (carrots, lettuce, orange,…)? Those who do use fertilizers, chemicals, etc. can then call their products “processed orange” , etc. I digress. But not really, because this issue, at least for me, has all the makings of a dilemma. I am a big fan of unprocessed plants, but due to the present circumstances, I am more or less forced to also rely on nutritional supplements. The “circumstances” I am talking about refer not only to the situation described above. They also include the fact that we, in our very busy lives of today, hardly ever have the opportunity to eat normal food anyway. I use the words “us” and “we” because you are presumably familiar with this dilemma through your own experiences. Even though I try to avoid nutritional supplements, I keep an eye out for good products that can provide relief when it comes to sufficient nutrient supply and the body’s actual use of those nutrients. Because I am sure that I am not alone, I want to incorporate my past experiences in this article. In doing so, I want to focus particularly on the product Athletic Greens, or more specifically, my experiences with the product (don’t let the term ‘athletic’ in the product name confuse you, more on that below). In the past, I have tried the odd powder, in part out of curiosity, in part out of real interest to see how much of what it promises it actually delivers. So, I would like to share my thoughts about Athletic Greens with you in the following report on my experiences with the product, because you may be in the same dilemma and don’t want to shut yourself off from the topic of sensible nutritional supplementation. I became aware of Athletic Greens because the European team of Athletic Greens contacted me. They saw my informative carbohydrate table – website and wondered if Athletic Greens could be of interest to my readers. You should know that my website has developed very nicely in recent years with respect to number of visitors. Other people can also locate this information when they research it. This makes my website attractive for potential advertising. I receive requests on a regular basis, but I generally turn them down because the products are often not sufficiently trustworthy, and I therefore don’t want to pitch them to my readers. But since I make the contents of my website available to my readers completely free of charge, I cannot completely ignore the subject of income and expenses (in 2015, I put significantly more than € 1,000 of my own money into the website!). I therefore keep the option open to recommend certain products to my readers without obligation, if I have tested the products personally and consider them to be good. 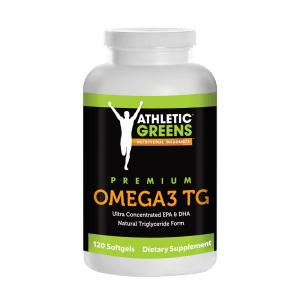 With Athletic Greens, I was initially as skeptical as I am with other products that are provided to me for testing. Especially with nutritional supplements and powders / shakes, the market is so oversaturated that I normally decline to test these products. Perhaps their timing in contacting me was just right, so that I ultimately agreed to test the product for myself, with the benefit of my readers in the back of my mind. I don’t know. But really does not matter, and, in the end, I am very happy that it came to be. 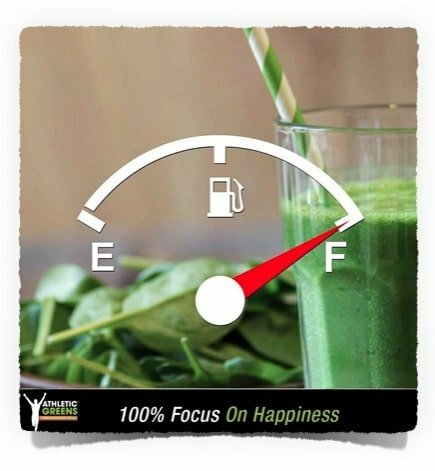 Most of my readers take the subject of food and nutrition very, very seriously because they want to provide their bodies with the necessary energy they need for sports, but also in everyday stress. Maybe it was exactly this which enticed me to try Athletic Greens. Wouldn’t be so bad if you could poke a hole through all these claims and warn readers of empty promises. Usually, these empty promises start with the taste of these powders. But what can Athletic Greens do in practice? In my research on Athletic Greens, I came upon other website operators that advertise Athletic Greens. These promise “immediate effect” or “super training results”. 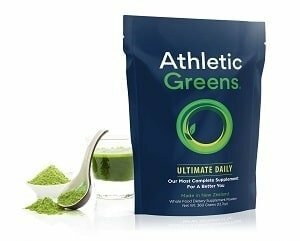 What did surprise me a lot, and in a very positive way, was the taste of Athletic Greens. 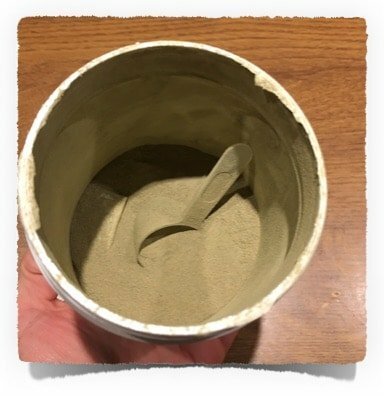 “Wow”, I thought, “finally, somebody at least figured out how get these things to taste good.” That is by far not something I can say about other nutritional / greens powders. But I am also aware that taste is a very personal matter. To me, Athletic Greens tastes refreshing. There is a bit of a sour aftertaste, but it is not bothersome. Another thing I found surprising is how quickly I got used to Athletic Greens. That is really the wrong expression. 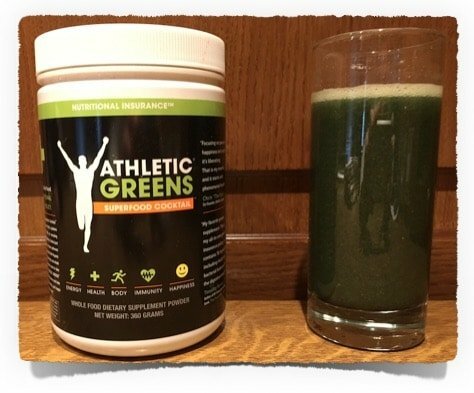 Within the first week, I was hooked on my daily morning Athletic Greens drink. Honestly, that was a first; I’ve never had such an experience with any powder – whether greens powder, protein powder, etc. And now, after my other important morning rituals, Athletic Greens is basically my very first thought. So, off to the kitchen to prepare a drink! 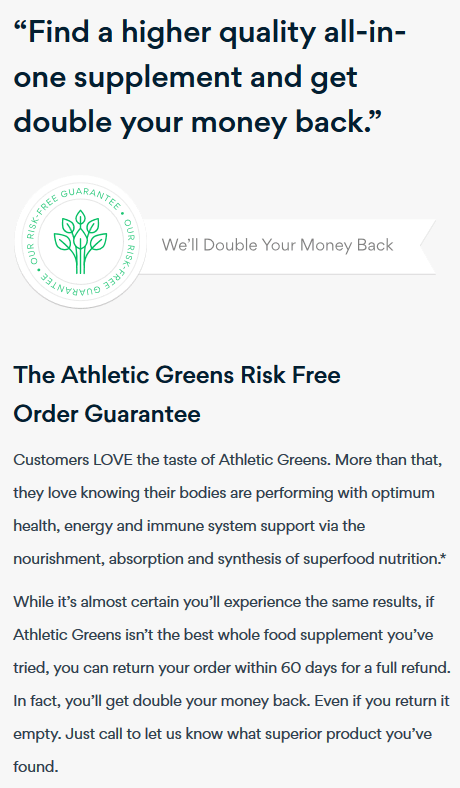 Here, Athletic Greens also delivers on its promise. The creators claim that the drink loaded with nutrients is ready in 27 seconds. That may not be its most important characteristic. But even if you’ve only had a little experience with shakes, you know that vigorous shaking is generally required before drinking. And even then you can still ‘look forward’ to clumps that you then attempt to squash with a fork on the edge of the shaker. So, you are either annoyed or busy for more than a minute – or both. And in the end, you force a few powder clumps down your throat that, upon making contact with the roof of your mouth, dissolve and cause a coughing attack… This is not the case with Athletic Greens. In fact, they recommend that the powder be mixed with very cold water. Really?? Powder and cold water? That can only result in annoying clumps! Here is the next surprise. The powder truly dissolves in cold water and, in general, leaves zero to hardly any clumps. Consequently, you really can prepare a greens shake in only a few seconds – and that without shaking, only thorough stirring (which I do with a fork because I feel that the gaps in the utensil aid in distributing the powder). Ingesting my daily Athletic Greens drink in the mornings thus quickly became second nature to me and a cherished habit. One day, I forgot to take my daily serving of Athletic Greens. Somehow, I felt ‘off’ all day. But not in the sense of having low energy or anything like that. I was rather annoyed and dissatisfied that I didn’t manage to take my Athletic Greens drink that day. It is said that it takes approx. 30 days to develop a new habit. With Athletic Greens, this process was significantly faster, at least for me, and took only a few days. I think it is because I feel that I am doing something that is good for me, in an uncomplicated form. Would I prefer to get these nutrients from actual food? No doubt!! And whenever my (too) busy life allows it, I prefer unprocessed, natural food as well. So how do I feel with Athletic Greens? First of all, I believe I feel clearly less hungry in the mornings. I notice that especially when I don’t have a chance to eat breakfast in the morning. Although there are many schools of thought as to whether breakfast in the morning makes sense from a human history perspective, I am certainly someone who values his breakfast. Coincidentally, at the time of the Athletic Greens test, I also tried to wean myself from coffee, at least for a few weeks. This was an experiment, for the benefit of my stomach. I would consider myself to be someone who enjoys a cup of coffee, but is not addicted to it (in general, I have a cup in the morning and then another one around 4:00 pm). One promoter of Athletic Greens writes that Athletic Greens makes him fit and he no longer needs any coffee. Initially, I also considered this statement to be a potential marketing ploy. Interestingly, I did not miss my coffee during the weeks of testing Athletic Greens – even though, as I said, I like it a lot for its taste (especially a nice ‘bullet proof’ coffee, black and no sugar, but with coconut oil instead!). Even some time after the experiment, I am still only consuming very little coffee. Coincidence, or a true correlation with Athletic Greens, with both the coffee experiment as well as the hunger pangs? Or just a placebo effect? I cannot rule it our for sure. But I also cannot rule out that it was indeed due to Athletic Greens. I would lean towards placebo effect if I had hoped for a definite positive effect prior to trying the product. But that was not the case for me. I began the trial with a healthy dose of skepticism and a bit of curiosity. when reading the reviews of other Athletic Greens customers, many said that they got sick with a cold in the first week after starting to take the greens powder. Interestingly enough, the same happened to me. And one week after finishing the first package, I again had a mil cold. Coincidence? I don’t know. The latter, I rather take as a good omen. There was a period of about one month between my first and second package. Exactly one week after restarting my daily Athletic Greens servings, I got another cold…! I really can’t make rhyme or reason out of this, but have read that this is a good sign – a kind of ‘cleansing’. As I said: you won’t necessarily have this experience, but if this is truly associated with Athletic Greens, I would guess that taking the product regularly will not lead to constant colds – that would not make any sense. And then came the day after the first month when my one-month pack was done. Nothing but emptiness in the package as I got up in the morning and, as usual, went into the kitchen and grabbed the Athletic Greens container. In that moment, I was very mad that I did not have another package waiting for me…(actually, I was already mad the day before as I realized I was taking my last serving). Since I was doing a test, I did not want to order another package until I had evaluated the product. 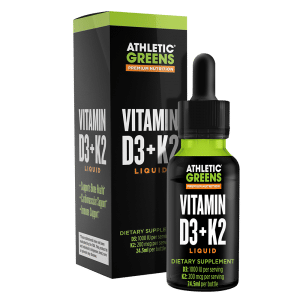 Normally, when you are an Athletic Greens customer, you automatically receive a new order every month or within another predetermined timeframe (for example, you can also order a double pack for 2 months, with savings in cost). You can thereby avoid the ‘disappointment’ I felt that moment. Yes, Athletic Greens is rather expensive (don’t let the price here scare you, continue reading to the end). Whereby expensive is always relative: for one person, the price tag is the deciding factor, for another, the priorities. Normally, (see more on this topic below), a one-month pack of Athletic Greens is a whopping € 87.00, or € 2.90 per day when taken daily. That is more than the competition. Of course, you have to be careful not to compare apples with oranges. I personally feel (I have no scientific proof of this), that it is worth the money. It is not a substitute for a healthy and complete diet. Is the high price possibly a marketing ploy so that customers think: “if it’s that expensive it must be good”? Could be, I cannot say. When talking about whether the product is worth the price, I personally think that Athletic Greens tastes good and produces the best ‘gut feeling’ of all the greens shakes I have tried so far. As is often the case, you get what you pay for. And especially when it comes to nutrition and nutritional supplements, I am personally prepared to pay more and save in other areas. I want to do my part in not just taking anything, but something that is of high quality. A cheap product would most likely be disappointing at a minimum, and, in the worst case scenario, have the opposite of the desired effect. But, as I mentioned earlier, costs are always a very personal decision. 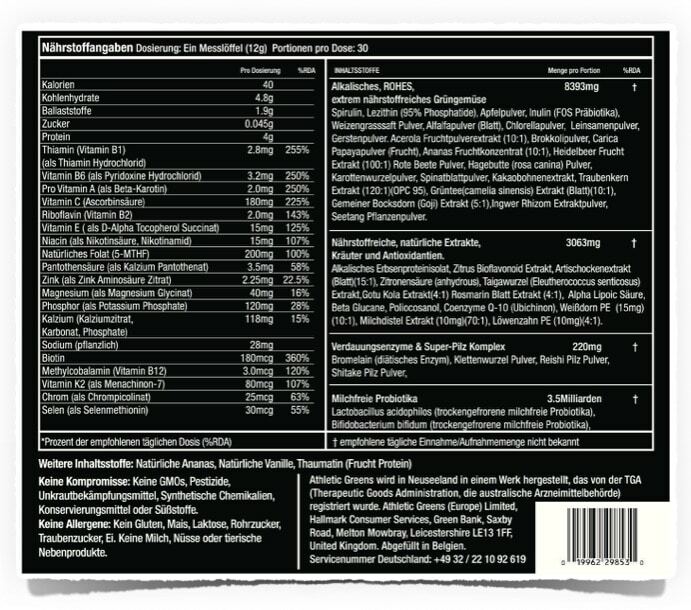 According to Athletic Greens, the product ingredients alone would cost a total of approx. € 750 if you were to order them individually on sites such as Amazon. Hmmm.. presumably also because you would have to buy many ingredients in large quantities. But nonetheless, this is a decent statement. Please also note the extraordinary money-back-guarantee that I mention in the next paragraph. The company offers a 60-day-money-back-guarantee on its product. Not satisfied with Athletic Greens? Just contact customer support and tell them that you want your money back, either via email at support@athleticgreens.co.uk or by phone. This guarantee is valid even if you have used up the entire product! Please be aware that you may be signing up for a subscription when you order Athletic Greens – it depends on how you place your order. You can do a one-time order, which is not a subscription, but the product is then more expensive. Or you can sign up as a loyal customer with a subscription. You then get each pack for a reduced price – your decision. If you sign up for a subscription, you also have the opportunity to order a double pack, with even more savings. An Athletic Greens subscription is useful in securing a constant supply. From my own experience, Athletic Greens customer service is always available by email or phone, if you wish to cancel your subscription. One email or phone call is sufficient, even right after the first order. Per Athletic Greens, you can cancel “at any time”. Additionally, with your first order, you receive a free copy of a 70-page guide, valued at € 39.95 (the 30-day schedule to lose weight by company founder Chris “the Kiwi” Ashenden). Please verify before ordering if the prices/promotions listed here are still current. These may change at any time, also to your advantage, since the Athletic Greens Team often runs special offers with an additional discount. That’s all. I hope you found this report on Athletic Greens informative. All information is subject to change at any time; the Athletic Greens team reserves the right to end or change all offers and promotions unannounced at any time. Therefore, please go to the official Athletic Greens website to see current pricing and promotions.